The Vele d’Epoca, the event in which the protagonists are the historic sailing ships that compete during the Imperia Regatta, has taken place in this splendid city situated in the Riviera of Flowers since 1986. On the occasion of this fascinating event Nyala Wonder Travel has put together a tour for sailing enthusiasts and others ……. Don’t miss the chance to spend a weekend full of excitement from an earlier era! 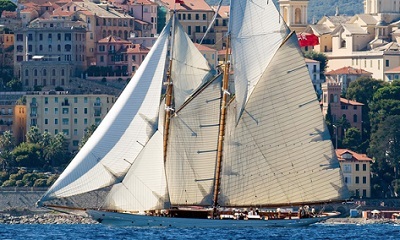 Book this fantastic itinerary which allows you to not only attend the Regatta in Imperia with its Vele d’Epoca, but also to visit the most beautiful spots in Liguria and on the French Riviera. Arrival in the morning in Imperia and, before beginning the visit, let us recommend a good restaurant. After a short walk, the afternoon is free for you to visit the ‘Le vele d’Epoca’ event. Evening free for a delightful visit to the medieval Parasio quarter, and overnight stay. For the second day we recommend you start the day with a spell of relaxation in the wellness spa of the hotel. Afterwards we suggest a visit to some local wine cantinas for wine-tasting, or an outing to the historic soap factory to discover the secrets of soap making. For the evening we suggest a visit to the slot machines and the gaming tables of the Municipal Casino of San Remo. In the morning, after a hearty breakfast, transfer to the Principality of Monaco, where you can stroll around the most exclusive boutiques near the Place du Casino, or discover the picturesque narrow streets of the “Rocca“, the ancient town. At the end of the visit departure towards the place of origin. Round trip travel and anything that is not included in “Our offer includes”. Lunches and dinners must be selected according to the menu of the day or the tasting menu offered by the chef. Drinks and snacks from the à la carte menu must be paid for on the spot. The visits recommended in the program are to be regarded as free, i.e. without a guide.